What’s the only thing sweeter than dressing a little one up as an adorable animal? Making yourself an equally cute accessory to match. 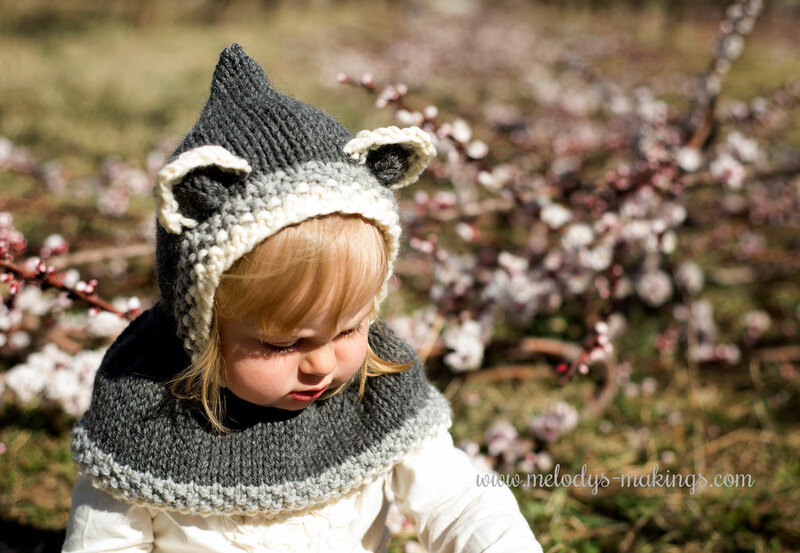 My Rustic Raccoon Hooded Cowl pattern is the perfect knit pattern for those matching sets. With sizes Newborn through Adult included, you could make one for every member of the family! This free hooded cowl knitting pattern comes in both knit and crochet (get the crochet pattern here) features bulky (5) weight (or use two strands of your favorite worsted weight) yarn. Repeat rows 7&8 until your project measures approx. 5.5 inches (14cm) in length from the starting edge. Bind off using the Three Needle Bind Off method (you will need to divide your stitches with 23 on each needle). Make sure your project has the right side (knit side) together before binding off. Cut yarn, and secure and weave in all ends. Working along the bottom edge of the hood, with the knit side facing and starting from the back corner, pick up and knit 48 sts around the base of the hood onto your circular needles. When you reach the front corner of the hood, continue by picking up your next knit stitch from the front corner of the other side (see photo 1). Be sure to evenly spread your sts along the bottom of the hood. When you have picked up all 48 sts, join your project in the round and place stitch marker. Continue to knit each round until your piece measures 2 inches (5cm) in length from the picked up edge. Bind off in a *K1, P1* repeated pattern. Cut yarn and secure and weave in all ends. Do not bind off. Using yarn or tapestry needle, take stitches off of knitting needle as if to purl. Pull tail through all stitches to cinch the bottom into circular shape. Leave tails on to use for securing to the hat. Use yarn needle to secure the ears to the top sides of the hood just behind the second row of color 2 (grey) yarn. Repeat rows 7&8 until your project measures approx. 6 inches (15.25cm) in length from the starting edge. Bind off using the Three Needle Bind Off method (you will need to divide your stitches with 24 on each needle). Make sure your project has the right side (knit side) together before binding off. Cut yarn, and secure and weave in all ends. Working along the bottom edge of the hood, with the knit side facing and starting from the back corner, pick up and knit 54 sts around the base of the hood onto your circular needles. When you reach the front corner of the hood, continue by picking up your next knit stitch from the front corner of the other side (see photo 1). Be sure to evenly spread your sts along the bottom of the hood. When you have picked up all 54 sts, join your project in the round and place stitch marker. Repeat rows 7&8 until your project measures approx. 6.25 inches (15.75cm) in length from the starting edge. Bind off using the Three Needle Bind Off method (you will need to divide your stitches with 27 on each needle). Make sure your project has the right side (knit side) together before binding off. Cut yarn, and secure and weave in all ends. Working along the bottom edge of the hood, with the knit side facing and starting from the back corner, pick up and knit 56 sts around the base of the hood onto your circular needles. When you reach the front corner of the hood, continue by picking up your next knit stitch from the front corner of the other side (see photo 1). Be sure to evenly spread your sts along the bottom of the hood. When you have picked up all 56 sts, join your project in the round and place stitch marker. Continue to knit each round until your piece measures 2.5 inches (6.25cm) in length from the picked up edge. Repeat rows 7&8 until your project measures approx. 6.75 inches (17cm) in length from the starting edge. Bind off using the Three Needle Bind Off method (you will need to divide your stitches with 28 on each needle). Make sure your project has the right side (knit side) together before binding off. Cut yarn, and secure and weave in all ends. 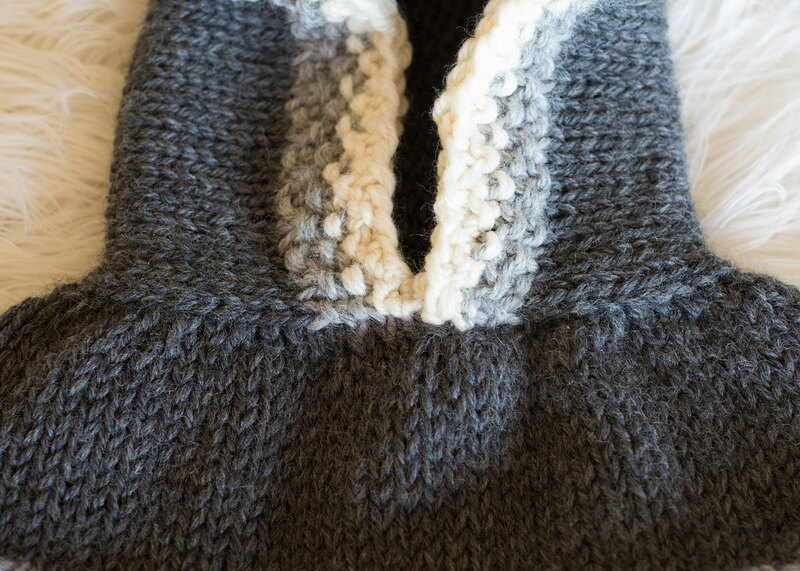 Working along the bottom edge of the hood, with the knit side facing and starting from the back corner, pick up and knit 60 sts around the base of the hood onto your circular needles. When you reach the front corner of the hood, continue by picking up your next knit stitch from the front corner of the other side (see photo 1). Be sure to evenly spread your sts along the bottom of the hood. When you have picked up all 60 sts, join your project in the round and place stitch marker. Continue to knit each round until your piece measures 2.75 inches (7cm) in length from the picked up edge. Repeat rows 7&8 until your project measures approx. 7.25 inches (18.5cm) in length from the starting edge. Bind off using the Three Needle Bind Off method (you will need to divide your stitches with 30 on each needle). Make sure your project has the right side (knit side) together before binding off. Cut yarn, and secure and weave in all ends. Working along the bottom edge of the hood, with the knit side facing and starting from the back corner, pick up and knit 64 sts around the base of the hood onto your circular needles. When you reach the front corner of the hood, continue by picking up your next knit stitch from the front corner of the other side (see photo 1). Be sure to evenly spread your sts along the bottom of the hood. When you have picked up all 64 sts, join your project in the round and place stitch marker. Continue to knit each round until your piece measures 3.25 inches (8.25cm) in length from the picked up edge. Repeat rows 7&8 until your project measures approx. 7.75 inches (19.75cm) in length from the starting edge. Bind off using the Three Needle Bind Off method (you will need to divide your stitches with 37 on each needle). Make sure your project has the right side (knit side) together before binding off. Cut yarn, and secure and weave in all ends. Working along the bottom edge of the hood, with the knit side facing and starting from the back corner, pick up and knit 70 sts around the base of the hood onto your circular needles. When you reach the front corner of the hood, continue by picking up your next knit stitch from the front corner of the other side (see photo 1). Be sure to evenly spread your sts along the bottom of the hood. When you have picked up all 70 sts, join your project in the round and place stitch marker. Repeat rows 7&8 until your project measures approx. 8.25 inches (30cm) in length from the starting edge. Bind off using the Three Needle Bind Off method (you will need to divide your stitches with 42 on each needle). Make sure your project has the right side (knit side) together before binding off. Cut yarn, and secure and weave in all ends. Working along the bottom edge of the hood, with the knit side facing and starting from the back corner, pick up and knit 74 sts around the base of the hood onto your circular needles. When you reach the front corner of the hood, continue by picking up your next knit stitch from the front corner of the other side (see photo 1). Be sure to evenly spread your sts along the bottom of the hood. When you have picked up all 74 sts, join your project in the round and place stitch marker. Continue to knit each round until your piece measures 5.5 inches (14cm) in length from the picked up edge.